Ashura and necrolatry are among the pillars of Shiite Islam, and have no limits in male-chauvinism. Our domestic figures, follow the same path, narrower. Each year for Ashura, the mullahs try a new trick. 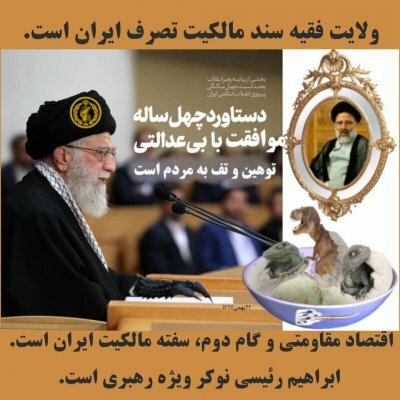 This year, they have mobilised babies and toddlers to manifest in support of the Velayat-e Faqih. The name is همایش شیرخوارگان حسینی / congregation of Hussein’s babies. In the Eighties, I took part, in Europe, in a meeting organised by the bygone party Djebheh – Meli – created in Mossadegh’s time, the 1950’s – and very much against Khomeiny’s regime at the time. The meeting reflected a veneration so fervent for Mossadegh that it was disgraceful. Two Iranians were overwhelmed in their own exuberance. They had made their fortune in Iran during the Shah’s rule, in the 1960’s and 1970’s, and lived in Europe since the Islamic Revolution. Witnessing so much enthusiasm, I imagined them leaving the meeting and starting a merciless battle against the Islamic Republic. Well no such thing! On leaving the venue, the twosome criticised piercingly the organisers of the meeting before going home peacefully to have their dinner, and forgetting all about the meeting. There is a thing in our frame of mind that praises the dead figures unquestionably and enthusiastically, but despises the people that presently are willing to move on and have something constructive to say. Shapour Bakhtiar while in exile in Paris, was heavely criticized by the Iranian asylum seekers. They mocked and insulted him disgracefully for his loneliness and weakness. They did not realise that he was on their side and that his force would come from those supporting his ideas. It was only after his assassination that many of his former critics created committees to discuss his high values. In their meetings, a large size portrait of him adorned with a black ribbon was present. Discussing his decisions and opinions was only permitted if it was to praise him. Moreover, the speakers made up quotes, told imaginary anecdotes and used him to boast their own qualities, even if they were sneered at a later stage behind their back. Those we praise and are ready to obey should either be a despotic leader, instilling fear, or they are dead (preferably assassinated) and worthy of martyrdom. Necrolatry is the right word for it. The Farsi equivalent word is somehow stronger: Mordeh-khori. Or as realists expand: “if you want to be a darling, die then and there!”. We so well know our fault. Why we do not do something about them? How long before he wears the Bassiji/Pasdaran/IRGC uniform and says Labeik to the Leader? Martyrdom, legend building, hence necrolatry, are among the pillars of the Shiite teaching, and know no limit. Thousands of Emamzadeh shrines are to be visited in Iran for omens; legends are told and embellished. Any historian or fact seeker about the Emamzadeh is chased as a heretic. Our domestic figures, in any domain, follow the same path, albeit narrower: viewed with contempt among the living, insufferably glorified after death.